The foundations of mentalism. Acclaimed as "a definitive resource for all who are interested in mentalism and probably for most in magic generally." Bob's list of 39 most important books to read, which is included in this ebook, is by itself hugely valuable, because you not only get a list of books but the reasons why each one of them is so important. This allows you to judge for yourself if you should read a particular book or not. Fundamentals can be seen as Bob's extraction of the most important concepts from these 39 books. This list of 39 books, or as Bob calls it "The 39 Steps to Mentalism" can be read here. Bob mentioned during an interview that this ebook has an unfortunate name, because many will look at it and think: "Fundamentals - oh I already know all the basics." However, these are not just the fundamentals for beginners, these are primarily the fundamentals that intermediate level and advanced level mentalists need to understand and internalize. Most questions mentalists have are answered in this ebook. "A Startling Thought Reading Effect"
My only complaint is that the rating system here at Lybrary.com only goes up to "good." This should be rated "outstanding" at the very least. There are only two books you NEED to read to become a good mentalist. This is one of them. 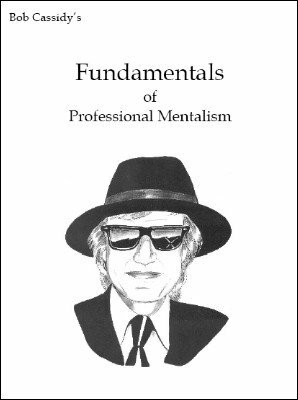 Add Osterlind's "the Principles of Mentalism" to Cassidy's "Fundamentals" and you have available to you the best advice gleaned from the best experience of two lifetimes. Within these pages, Bob recommends a different book for those who want to really learn to perform mentalism well. He's wrong, but it wasn't his fault. "Fundamentals" hadn't been published yet - and "Fundamentals" is the first book you want. Best of luck finding a mentalism book BETTER than this one.